Appointments for ultimate comfort and daily enjoyment are found throughout this impressive home design: Handsome front entry and foyer admit natural light through sidelights and a transom window, while decorative columns grace the transitions into the dining room and family room. Formal dining room features a cathedral ceiling and tall windows. Expansive family room's special touches include a cathedral ceiling, a fireplace, generous triple windows, and a French door to the back porch. 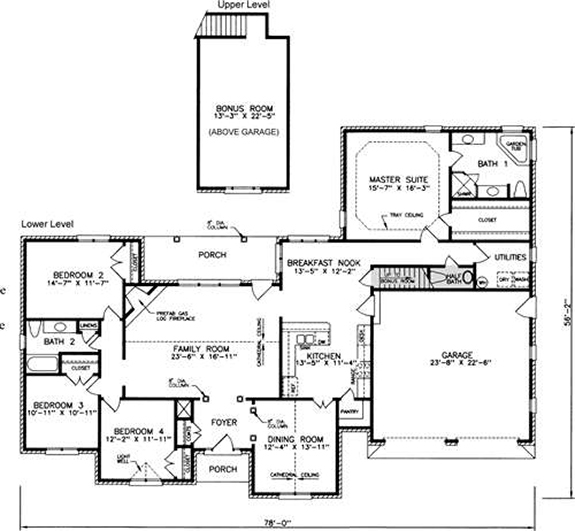 Kitchen layout allows easy service to the dining room and has a pantry and a counter for serving the breakfast nook. A utility room and a half bath are near the kitchen. A tray ceiling adds volume to the master suite, which also has a walk-in closet and a bathroom with two vanities, a garden tub, and a separate shower. 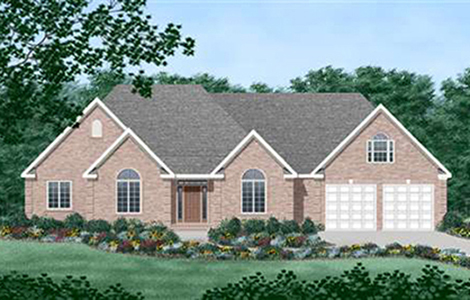 Nestled around the family room are bedrooms 2, 3, and 4 with a full bath and linen closet. Walk-up bonus room over the garage offers extra space for rec room, office, or multi-purpose room.